Some like it hot, but the Sultanate of Oman on the southeast coast of the Arabian Peninsula is probably too hot for most visitors to bear during its searing, scorching summer season (between May and September) when the thermometer can reach a peak of around 50 °C (122.0 °F). 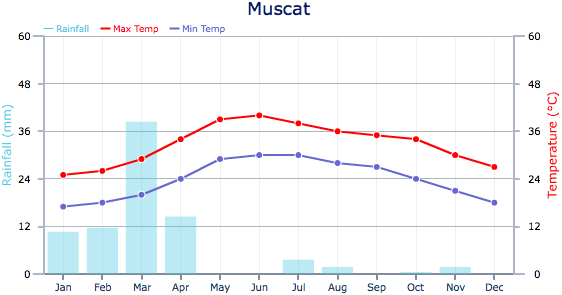 Surprisingly in the coastal capital, Muscat (the destination of most holidaymakers) this is exacerbated by seasonal high humidity levels, especially along the coast, because this country lies in the tropics. Fortunately the sweltering conditions in Oman are relieved on the country’s border with Yemen, where lie the Dhofar Mountains, exposed to the south east monsoon from June to September, which brings a temporary oasis of green alongside the desert. This rainy season is confined to the mountains, bringing in fog and drizzly rain from the Indian Ocean. It seldom rains in Muscat, sited on the entrance to the Persian Gulf, but when the rain comes it falls in short, heavy showers, usually in January, and flooding has been known. Generally, though, Oman experiences a hot desert climate with the typical great discrepancies between night and day temperatures, and little or no rainfall. The harsh heat is exacerbated on occasion during the hottest time of year (March to August) by the incidence of a wind known as the Shamal, which can cause sandstorms. When is the best time to go to Oman? The best time to brave the heat of Oman is between late October and March, when daytime temperatures in Muscat can be expected to be around 30°C (86°F). During the rest of the year the heat and humidity is debilitating, particularly between May and August, except perhaps during these months in Salalah, were light rain tames the heat. Light and loose fitting clothing is the best option for the heat and full length clothing respects the importance of modesty in the local dress code. Smart-casual or formal wear is preferred and avoid revealing clothing, e.g. short skirts, above the knee shorts, bikinis, low cut tops and tank tops. Rather wear long trousers, loose and light long sleeved shirts, or knee length shorts and loose short sleeved shirts, T-shirts, full piece swimwear and a light covering; and a light raincoat or umbrella for the rainy season. While clothing is more flexible on some desert safaris, modesty for mosques is essential; and they will refuse entry to people deemed to be inappropriately dressed. Note: In January the weather in Oman, particularly in Muscat, is relatively comfortable with reasonable temperatures and humidity levels of around 63%, during the day, much cooler at night. It is a great time to enjoy the beach and many watersports on offer, with little more than occasional spots of drizzle to mar the sunny weather. Events: Experience the traditional Omani lifestyle and culture at the annual Muscat Festival held between January and February. Note: In February daytime temperatures in Oman are comfortable, with around 11 hours of sunshine a day and little or no rain. UV levels are high, however, so take care when out and about. Note: Ideal holiday weather prevails in Oman during March, with hot, sunny days, moderate humidity levels and negligible threat of rainfall. Note: Hot days and balmy nights can be expected in Oman in April, with humidity levels down to around 46%, and conditions dry. This is the onset of the summer season and is probably the last chance to enjoy the country before the scorching heat sets in. Note: During May Oman bakes in under a hot sun for around 13 hours a day, and night-time temperatures remain high, bringing little relief. Conditions from now on through the coming few months are too hot to suit most holidaymakers. Note: The average temperature above belies the fact that daytime temperatures in Oman in June can reach highs of around 40°C (104°F. ), dropping at night to around 30°C (86°F). Even the warm sea provides little relief from the heat. Note: Temperatures decrease marginally in Oman in July, and there may be rare thunderstorms, particularly in the Dhofar Mountains, as a result of the south east monsoon (Khareef). Conditions are uncomfortably hot for outdoor activity. Events: The Salalah Festival during July and August provides plenty of fun with cultural, traditional and art events. Note: In August Oman’s oppressive heat is a little overpowering for most western tourists, although the Dohfar city of Salalah is attractive for visitors as the monsoon cloaks the area with greenery and waterfalls. Note: The heat index is dangerously high for the unacclimatized in Oman during September, with very high temperatures and humidity averaging 67%. Note: October is officially the end of the baking hot summer season in Oman, but the there is little relief from the high temperatures by day. The wet season in Dhofar has come to an end, but the resulting greenery has not yet dried out and provides for some spectacular scenery. Note: November is a comfortable month to holiday in Oman, with the notoriously high temperatures of the preceding summer season tailing off to more reasonable levels, and little or no rain across the country. Note: “Snowbirds” fleeing from the chill of winter in the northern climes will find idyllic holiday weather in Oman in December, with warm temperatures and sunny skies. The threat of rain is confined to an occasional drizzle along the coast.